There are a lot of wool-felt slippers being made these days. Even the Chinese have taken to knocking them off. The fact remains, that the Gottstein folks invented them in 1888, and have been making them ever since, in their same village in Tyrol. The Magicfelt take the wool from the first spring cutting, and felt it in their local, pure alpine water, without any harsh chemicals. They then shape the felt, seamlessly (! ), into perfectly anatomic comfort. There are no better fitting, or lighter weight, felt slippers. You may have them with a naturally rubberized or leather sole. Come in Men & Women’s European sizes. 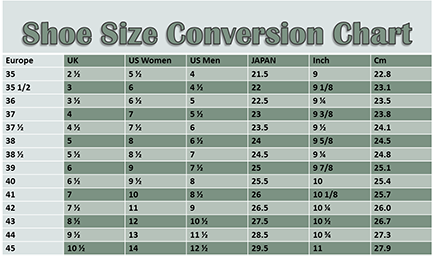 Please see size conversion chart below. Also, if this is a gift or you need these slippers right away, your size may be backordered, so please allow 4-8 weeks for delivery. These slippers are handmade in Germany for you at the time ordered, and then sent to us. SPECIES PROTECTIONWhat attracted us to Stegmann, besides their obvious quality and fit, was the fact that they are actively engaged in Species Protection. As you probably know, many species of domestic farm animals are dying out. For any number of reasons, but principally, uniformity makes industrial farming easier! We support Species Protection, because we feel it important to keep those gene pools as complete and pure as possible. (Like a seed bank on four legs). To that end, we offer felt slippers from the wool of these 10 sheep species: the Tirol Stone Sheep, Tiroler Bergschaf & Steinschaf, Gotland, Coburger, Shetland, Yak, Alpaca, Camel, Manx Loaghtan and the Swiss Jura Sheep.